Its been many years since walking the ridge along Crinkle Crags and the weather today was meant to be excellent so today was the day for another tougher walk! Great Langdale Beck with the slopes of Pike of Blisco and Crinkle Crags forming the beautiful Oxendale behind. Rossett Pike at the end of Mickleden. The Band - not going that way today. And up the steep side to Browney Gill. I always forget how steep and how much hard work it is going up this path. Thats Whorneyside Force over there, the plan is to come back down that way. Zooming in on Whorneyside Force. A view into Great Langdale. The rocky crag that is Great Knott. A look down to Red Tarn. And was rewarded with this just minutes later! And it just got better and better as I was standing on the summit of Great Knott. Crinkle Crags looking superb today. A view towards Pike of Blisco and Red Tarn from the summit of Great Knott. Cold Pike now free of cloud. Over there is Little Stand. A view back to Great Knott and Pike Of Blisco. And the route ahead to the First Crinkle. Steep crags and whispy cloud. The summit cairn on the First Crinkle. Its a great shame about the haze and cloud as the view to Eskdale was greatly reduced but you can just make out Slight Side on Sca Fell. The Bad Step - always good fun to climb up! Hint: Stick to the right hand side. All sunny on the summit of Crinkle Crags. And now a bit of a view to Bowfell and the Fourth and Third Crinkles. Crinkle Four and Three (Gunson Knott). 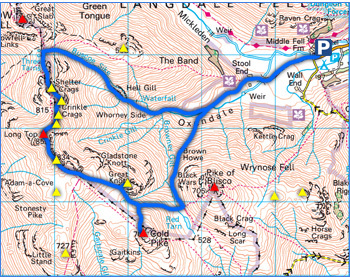 Im heading up to Gunson Knott first. Another steep gully between the Crinkles. The summit cairn on Gunson Knott - Crinkle Three. A fantastic but hazy view down to Great Langdale. Crinkle Four, Five and Shelter Crags. Another photo of the summit of the Third Crinkle. The First Crinkle from the Third. The summit cairn on the Fourth Crinkle looking down to the Fifth and beyond is Shelter Crags. The summit cairn on Crinkle Five. A view back to the previous summits. Fifth Crinkle summit with Shelter Crags behind. Descending to Three Tarns with a view to Bowfell. A view of The Band as I make my way off the main path and look for the path down to Hell Gill. Found the path and now heading down with a great view of Pike of Blisco all the way. An amazing shape to Pike of Blisco. Just near Hell Gill now and close to Whorneyside Force. Unfortunately this is the best view of Whorneyside Force from the path (thankfully I had the drone with me for some amazing video). Heading down into Oxendale and things are feeling very summery. Intense sunshine with a slight mist making Crinkle Crags appear to tower over me like Mt Everest! Almost at the end now but what a fantastic walk that was! A final shot of the Langdale Pikes at their best!